Just in time for the holidays, a service called Zibby is launching to give the underbanked and thin-file or underwater credit applicants a way to buy white goods online. Cognical, the company behind the Zibby payment option is the brain-child of 37-year-old Brandon Wright and his wunderkind chief technology officer, the 23-year-old Chinedu Eleanya, is angling to make it easier for consumers with low credit ratings or no credit ratings to buy the things they need online. The company, which graduated from the Entrepreneurs Roundtable Accelerator in New York, was founded in the summer of 2012 as a way to solve the issue of lending to consumers with little or no credit histories, or bad credit, for items like washing machines, dryers and other durable goods. So that’s exactly what the company did. Think of it as a lease-to-own payment option now available online through the company’s service — dubbed Zibby. For Wright and his co-founders, the Zibby service offers a way to solve the problem of unsecured lending. 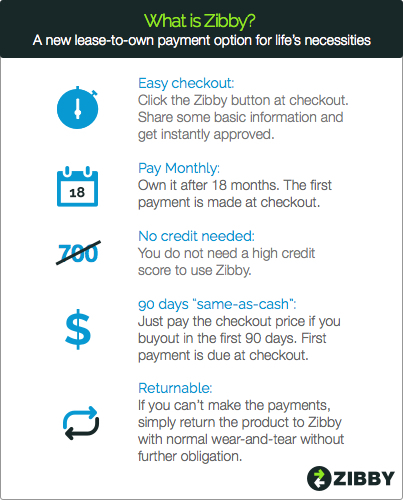 Using a simple three-step-process an applicant can browse online for a purchase, be transferred into the Zibby site at the time of payment, and enter a few pieces of information. They’re credit is secured in a matter of seconds and they’re returned to the original e-commerce site to fill out the rest of the information that may be needed for delivery. ‘The lease-to-own product does not exist for the online consumer. The cost of lease-to-own is dramatically lower than the cost of unsecured debt. [And it’s] is a way to get consumers access to necessities at a lower cost than if we were just to lend them money,” says Wright. Unlike a brick-and-mortar lease-to-own store, customers using Cognical are guaranteed a new item, which is less subject to wear-and-tear and is likely to last longer than a previously rented item, according to Cognical’s chief executive. The company also benefits retailers by opening them up to customers. Roughly 46% of people have a credit score less than 700, which renders them ineligible for a lot of credit cards and therefore incapable of using credit to purchase big-ticket items online, where those purchases can be cheaper. And for retailers trying to reach the new, millennial consumer, nearly 34% of that population don’t have credit cards. Wright and his team were initially focused on selling tools to provide better insights into loans to underbanked clients to lenders, but quickly found that the market wasn’t receptive to new technology. So in 2013, the company pivoted from focusing on lenders to becoming a lender itself. Currently, the company is offering its services through small online properties in the Midwest, but Wright says that it will expand into other retailers who sell online in the next few months. “By January we should be live with retailers that have $3.2 billion in sales,” says Wright. The company’s Zibby payment option should begin cropping up on select retailers websites in November, with a larger roll-out (an additional electronics shop) slated to come online in February.